It seems just about every week there's a new story on primate intelligence showing them to be much smarter than many had originally thought. This story is from three weeks back but I missed it when it came out. 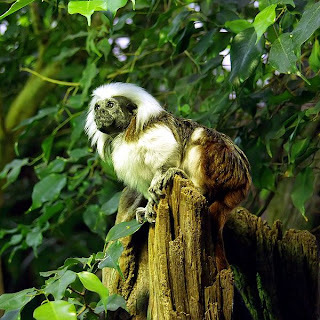 To sum up the study: cotton-top tamarins were given training in a fake language that used prefixes and suffixes, and after getting used to the language they were then bewildered when sometimes an error occurred (inserted at times intentionally by the researchers) where a suffix would suddenly become a prefix or the other way around, just as how you or anyone else would be a bit wilderedbe if I were to write a word in that way here. Note that the language they are using there seems to be completely regular, and it would make sense to assume that primates would have an easier time mastering a language without any exceptions than a natural language with all its irregularities. I've always thought this to be an interesting argument for the use of a regular constructed IAL, considering primates' ability to recognize human languages even if they can't speak them themselves. In other news, India is setting up a training school for rogue monkeys in order to teach them manners.